Fiire announced availability of its media client for LinuxMCE – FiireStation 1. It is designed to be installed on the VESA standard mounting on the back of most current LCD or plasma TV. FiireStation is thick, noiseless and power. It features 1.5 GHz processor and 512 MB of ram. High performance graphic subsystem based on Via UniChrome Pro II with a sophisticated hardware accelerated video decoder/renderer allows to display analog and digital video interfaces and resolutions from Standard Definition to 720P and 1080i. Audio support is also nice – up to 7.1 channels via S/PDIF and 2 channels of 192/24 analog audio. The FiireStation 1 supports Alpha Blended LinuxMCE user interface with 3D effects (I suspect that it can be used with Plutohome as well). 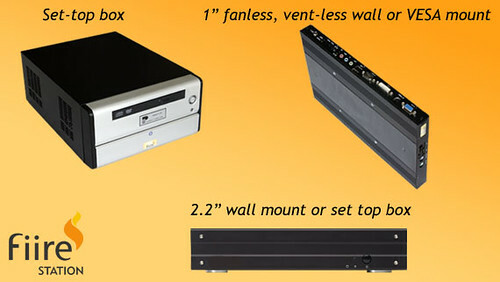 The big advantage of FiireStation 1 is its form-factor which allows to hide it (doesn’t matter how it looks like), get completely fanless, ventless and noiseless solution much enough to play full HDTV. The bad things are coming from the good side. Because the FiireStation 1 is gonna be behind TV there is no way to play DVD directly on that media client. Another disadvantage is leak of built-in IR receiver to use ordinary remote control (if somebody doesn’t like the coolest FiireChief). The price of the FiireStation 1 is not too cheap as we want. It’s about 900 dollars which is more expensive than FiireEngine. Set your house on Fiire!